I used the same green on the reverse of the project, and then thought afterward that I could have pieced it from my scraps. Oh well, it looks super anyway. I'm quilting on a beautiful project for a sweet friend of mine. We used to work together, and I miss seeing her every week, she's just adorable. I hope to have this finished in the next couple of days, I hope she likes it. Now, I only used the recipe for the meringue, I didn't bother with the same fillings they used. As you see, there are strawberries, whipped cream and raspberry coulis. And ohhh my goodness, it was delicious! There were only four of us at dinner, and we demolished the whole darned thing! Such a super easy pattern, and really wonderful for scrap busting. I know I have some other blocks I'll give the same treatment soon. Easy in the ditch quilting for the logs (which are half inch finished), a sort of squashy flower in the plain squares, and a half flower in the setting triangles. And because I'm still enjoying working with scraps (and happy to use scraps that won't work in the Omigosh! project), I raided my 2.5" scrap box to piece the back. Wow, there is some age on some of those pieces there. That yellow check on the right is probably twenty years old. For real! I know you're all curious about how my talk went with the Gawler Quilters on Monday night. Well, it was really fun, and not at all intimidating. I wasn't nervous at all, right up until I actually stood up, but I don't think any nerves showed at all. I took the ladies through my quilting journey, sharing my first quilt, and a selection of my quilts right up to now. Everyone laughed at all the right moments, and no one fell asleep, so I'm thinking I can call it a success. And the sweet ladies of the group presented me with a lovely pot-plant as a thank you. Isn't it pretty? I know it will look lovely out on the verandah. And a big hello to the ladies from the Gawler Quilters who are readers of my blog, it was lovely to meet you! I'm going to do a little more work in the sewing room tonight, and then call it a night. It has a super busy week and I'm really feeling weary. Camo has a bye for tennis tomorrow, so I can even sleep in if I want, what bliss!! Yesterday was a super fun day at the craft fair. A bunch of us looked after the Guild area with white glove duties, chatting to visitors and sitting around stitching. Even though this was made around fifteen years ago, I really still love it. I've learned a lot since then - I really was quite a beginner. I probably wouldn't have taken it on if I knew what I was getting myself into. That centre block contains the fabric I used in my Omigosh! block on the weekend. And on closer inspection, I see that the block to the right of it has some points seriously cut off! Something I'd never settle for now. And there is the triangle made with the fabric. I'm pretty sure I would have hand pieced all the triangles you see in the picture - no way I would have had the skill to machine piece them way back then. The triangle is looking a little wonky from the fold running through it. I really must remember to refold my quilts occasionally. Tonight I have a slightly scary thing to do - but hopefully I'm all organised. I'm giving a talk on my quilting journey to the Gawler Quilters. I'm starting to think that I may have too many quilts for show and tell ... I hope no-one grows bored. I'll let you know how it goes! Piecing on scrap projects can be such fun. Today I spent a lot of time delving through my scrappage and cutting to add more variety to pieces I'm using in this quilt. At the bottom of one of the tubs, I found such treasures that I'm now piecing with. The medium brown fabric you see in the HST's and the centre of this block must have been in my stash for 15 years now. It was gifted to me by my sweet friend Linda while we were working on our Dear Jane quilts way back when. I really love it, it's super cute. I know one of my DJ triangles is made from that fabric, and I'm pretty sure I used it to piece a block too. My DJ quilt is at the Sewing, Stitching and Handcraft show this weekend, so I'll check it out while I'm there tomorrow. And the pink you see in the tiny squares there is from my Farmers Wife quilt, as well as the red in the small square near the top. The red in the small square at left is from the binding of my Mrs Billings project. The green in the little square on the right is from the binding and the zig-zag border from my Nearly Insane quilt. The fabric that won't quit! That mid blue fabric there - the one in the HST's and the centre ... that particular fabric was used in my first ever quilt ... 22 YEARS AGO! I have been trying and trying to rid the 'first quilt' fabrics from my stash, but seriously, they just won't quit! I keep finding it everywhere. There were only three fabrics, and when we were first married I didn't have the funds to buy tons of yardage, so WHERE is it coming from?? 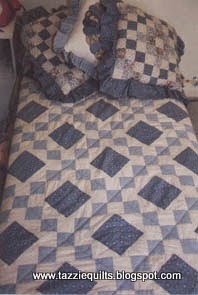 And the picture above is the actual quilt. My first ever. I have no clue where it is right now. But I can tell you with certainty, it is badly pieced, badly quilted (on my first sewing machine with no thought of a walking foot) and I just know it will have that horrible puffy polyester batting. It would be super tempting to track it down, and pull it to bits to quilt nicely. There are just way too many lovely projects to work on however, so I can't imagine such a tricky task will be in my future ... Would you do it?? First up, I just have to share with you something that I witnessed in the dining room recently ... it has been so cold and wintery here, that it's challenging to get laundry done. Not the washing, but the drying - because I'm not really a fan of the tumble dryer for some of our clothing items. The new issue of Quilt Mania arrived at Hetties Patch this past week, and I simply could not wait to get started on the next border. I've pieced it all, but only attached two sides - even though I have not even nearly finished the appliqué border. I love how the project is coming along, and though I'm still hopelessly addicted to piecing on the Omigosh! project, I am determined to have the appliqué finished before the next issue comes out. That gives me around six weeks or so I'm thinking? The charm squares are the perfect size for the tumblers I'm working with, and it will be fun to check out this new-ish collection as I cut out the shapes. Today Mum, Camo and I went up to Mannum to visit with Nanna. It's so nice to be able to do these things in the holidays ... it's so much harder during the school term with kid sport on the weekends and work/school during the week. We took Nanna shopping and out to lunch, and while we're in Mannum, we always check out the local second hand and antique stores. Over the years my eye has become trained to look for a certain little box, and just as we were getting ready to leave one store, I spotted THE BOX. It was a Singer Featherweight box! Of course I dashed over and checked it out, and was baffled to see that even though the box was a little battered, it contained most of a Singer Featherweight 222K ... and it was priced at $30.00!! When I saw it, I called Marty and asked him if I should buy it, as he is the one that will have to do all the hard work fixing it. He said YES, and why are you still on the phone, go grab that thing!! So I did :-) Happy day! Kaffe Fassett sock yarn! I love the colour, don't you? Now, I haven't done much knitting lately, but you never know when you'll have the spare time, so I just had to bring it home with me also. There are 33 blocks there - at the top are two bundles of ten, bottom left another bundle of ten, and three of the nine patch blocks bottom right. I worked out that I need 361 blocks to make the quilt the size I want, so I'm almost one tenth done! I was able to piece some more blocks tonight, but I'll be super busy for the next couple of days, so I doubt I'll have any stitching time until Sunday, then I'll be at them again. Well, it's getting late here now and I need an early(ish) night, so I'll sign off ... chatter soon! Yay for school holidays, as today I've finally managed to get some work done that I've wanted to do for a long time. I've finished getting my Celebration Star Christmas Tree Skirt pattern ready for my Etsy store. Perhaps my procrastination was because I thought it would be appropriate for Christmas in July projects? It's more like it takes me considerable brain power to get my head around Photoshop and my scanner each and every time I use them ... but let's not go there. 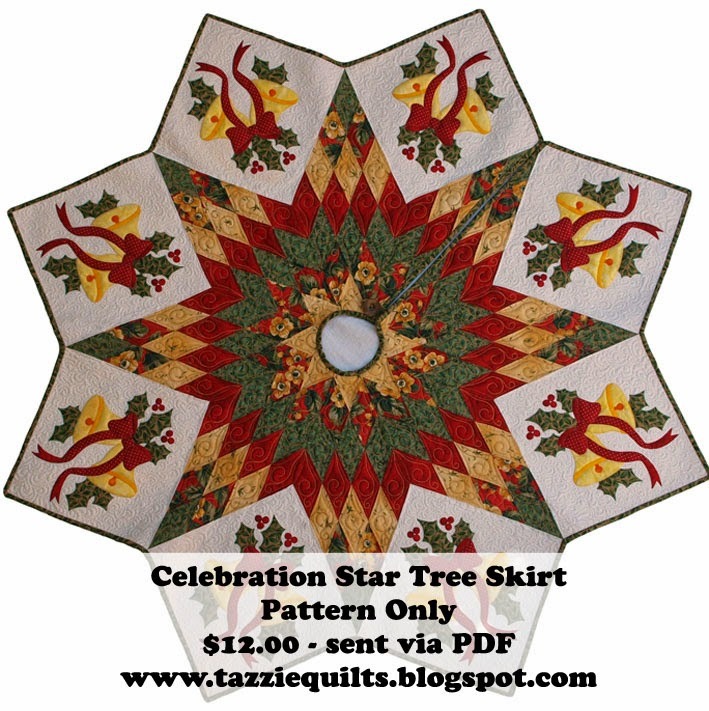 Anyway, I hope you like it, I know that my Simple Tree Skirt has been super popular ... but this Celebration Star will be for those of you looking for something just a little more of a challenge. I used fusible appliqué techniques, but you can use any technique you like, and it's not a huge project, so you get fancy with your machine quilting on your domestic machine. And don't forget, if you need any help with construction, I'm here for you! Well, have fun with the pattern friends, and I'm now heading back to my sewing machine. I am hooked on this Omigosh! project!! Do you all remember my Ladies of the Lake table runner? It's really nice and so very relaxing to stitch a few seams by hand, and it's such a long time since I've actually hand pieced. Appliqué yes, but not actual seaming. Anyway, hopefully I'll get more of this cut out and I can have it in the car for stolen moments waiting for small people. And how fun to see that Karen is working on tumblers too, I love to see what other people are working on in blogland, always so inspirational. Lastly, while I was doing a little sort in the sewing room yesterday, I found these blocks that I had completely forgotten about. I think I'll put them together into a little something during the school holidays. There are eleven blocks - I may have to make a few more blocks, or lay them out and see what comes together. How fun to find forgotten projects. I know I must have more than a few of them! Check out my shadow there ... I have mad photography skillz!! I should have made up one extra of the nine patch blocks before I decided to post, just to fill in the empty corner. I'll work on that before I head to bed tonight. I hope you don't mind me using your picture Linda, but I think this is too much of a hilarious coincidence not to share. Looks like Linda is way further along than I am, and of course I absolutely adore all the fabrics she has chosen. Seriously, I was gobsmacked when I received Linda's message, but honestly, I shouldn't be surprised, we're like quilting sisters! I'm not certain of those little buds going into the corners just yet, I want to see what it looks like when I select a flower for there - and I'll put a few little leaves and doodads next to that little lonely flower there, or maybe some embroidered stems ... I know the border will tell me what it needs as I go along. Tomorrow will be a fun day, it's the 'Not the Farmers Wife' sewing group visit at Shay's house. It's sure to be a fun day ... and unlikely that much stitching will be done, a lot of chattering, laughing and eating if the past is anything to go by. Super fun!